Hi, I'm Josh Tynjala, and I'm working on the ActionScript & MXML language extension for Visual Studio Code. You may know me as the creator of Feathers UI, an open source user interface component library for Starling Framework and Adobe AIR. Adobe no longer updates Flash Builder, and the latest version isn't particularly stable anymore. While ActionScript and MXML support continues to be maintained in IntelliJ IDEA, there hasn't been a lot of new development lately. Newer SDKs, like the Feathers SDK and Apache Royale, require special workarounds and extra configuration to work. We deserve better. That's why I started working on an ActionScript & MXML language extension for Microsoft's popular (and open source!) Visual Studio Code editor. I believe that it's now up to the community to ensure that we continue to have a modern development environment for ActionScript that supports all of the SDKs and features that we use today to build our projects. 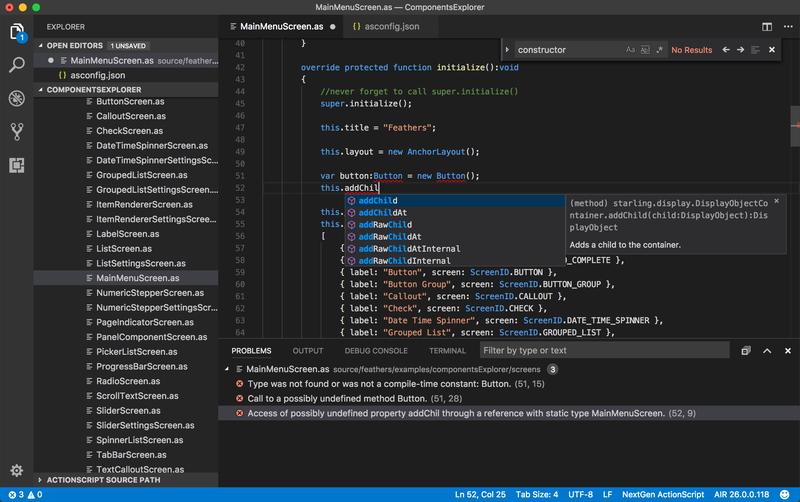 As a patron, your contribution will support continued development of this VSCode extension, and I will share exclusive, early previews of new features as they're still in development. Does this project help you out by saving you time and money? Do you want to support new, open source, high quality developer tools for ActionScript, Flash, Flex, and Apache Royale? Please consider becoming a patron.